It’s been a while since I posted part one of this review, but better late than never – after the longest month of my life, we finally got a new oven and I recovered from my cooking fatigue. It has been wonderful getting back in the kitchen, and with a shiny new oven no less, and I was really delighted to return to this book. I’d found the dishes I tried in January to be really flavoursome, and I’m happy to say that trend continued. 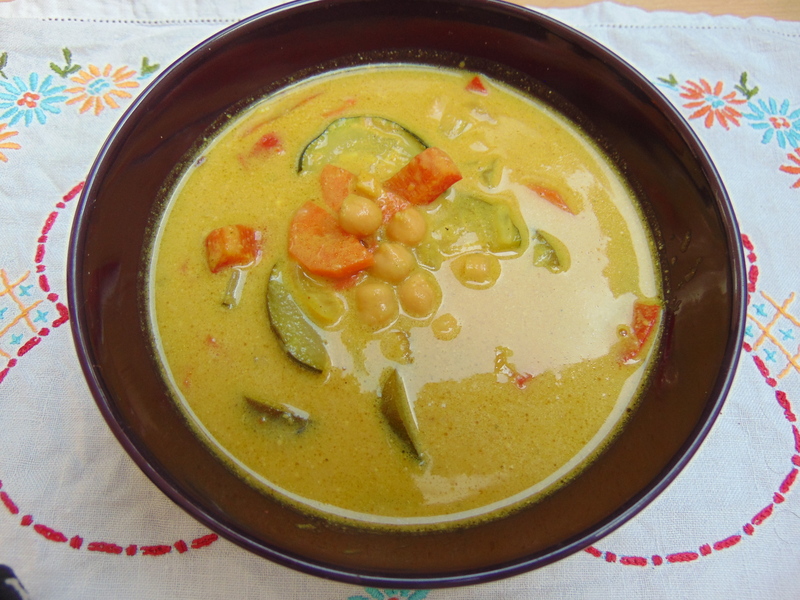 I would have liked a few more soups in this book, so I turned the chickpeas in peanut butter sauce into a soup by adding more stock. It was just my cup of tea (metaphorically speaking, of course): coconut milk, peanut butter, chickpeas, and a good spicy kick! Lovely. I was really excited about trying the teriyaki tempeh with butternut and cauiflower sauce, but the teriyaki sauce I made was a little thinly stretched over all the veg I roasted. This was my fault rather than the recipe’s – next time I’d probably make a double portion of sauce just to be sure I had enough. The sauce was tasty, but it didn’t come through strongly enough because there was too much veg and tempeh. Still, it was a quick, easy and pleasant meal. 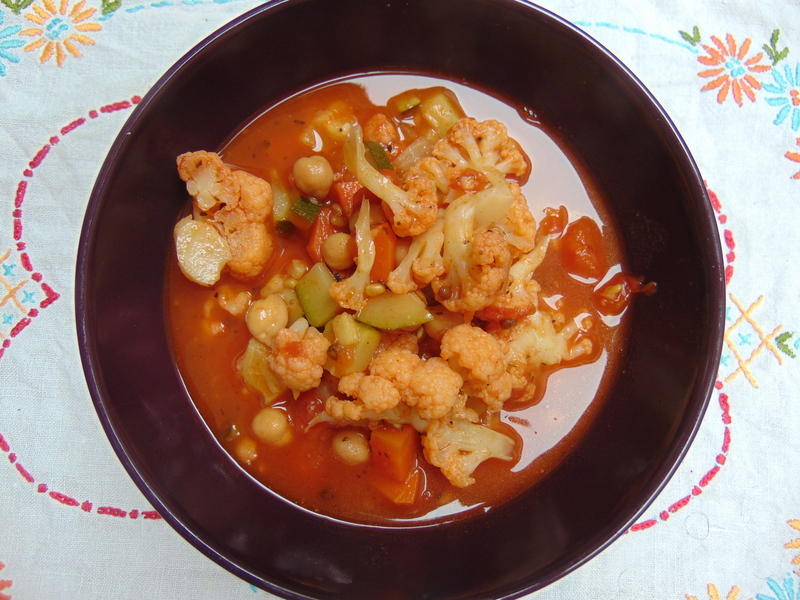 I tinkered with the cauliflower and chickpeas in berbere sauce a bit too – again, I wanted to make it into a soup, so I added quite a bit of extra stock, and I was a little heavy handed with the fenugreek seeds in my berbere sauce (possibly because I was so excited about finally finding them in Prague! ), which upset the balance of flavours a little. I’d still like to try this as it actually should be served. The firecracker cauliflower bites sounded a bit scary to someone with a pretty low tolerance for spicy food, but I went bold, and I’m glad I did! 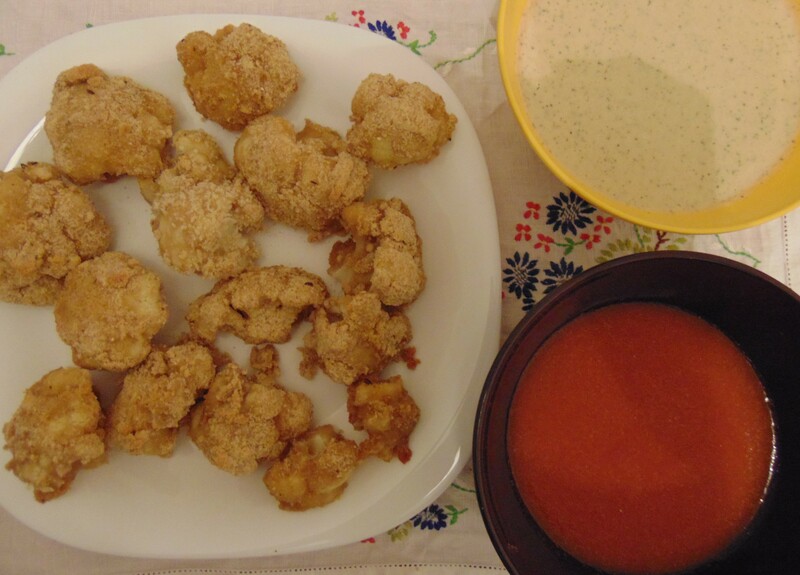 This recipe brought together a few different components: crunchy baked cauliflower, firecracker sauce and ranch dressing. We simply dipped the cauliflower in the firecracker sauce rather than coating the pieces, and this definitely helped to retain the crunch. I loved all components of this dish -the cauliflower was really well coated thanks to the batter layer, and cooked perfectly, the firecracker sauce was spicy but was complemented by the cooling and well-seasoned ranch. We make some variation on buffalo cauliflower pretty regularly, and I think this is now my preferred recipe (though there’s lot to be said for the blue cheese dip from But My Family Would Never Eat Vegan!). Both the firecracker sauce and the ranch dressing popped up again in this firecracker chickpea salad with peanut dressing. 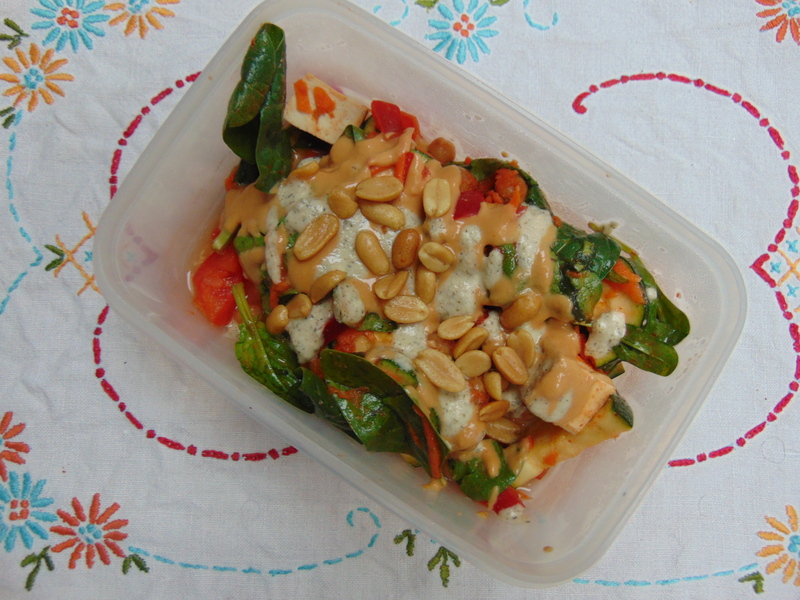 It was a really tantalising balance of flavours, and I just loved that peanut dressing. 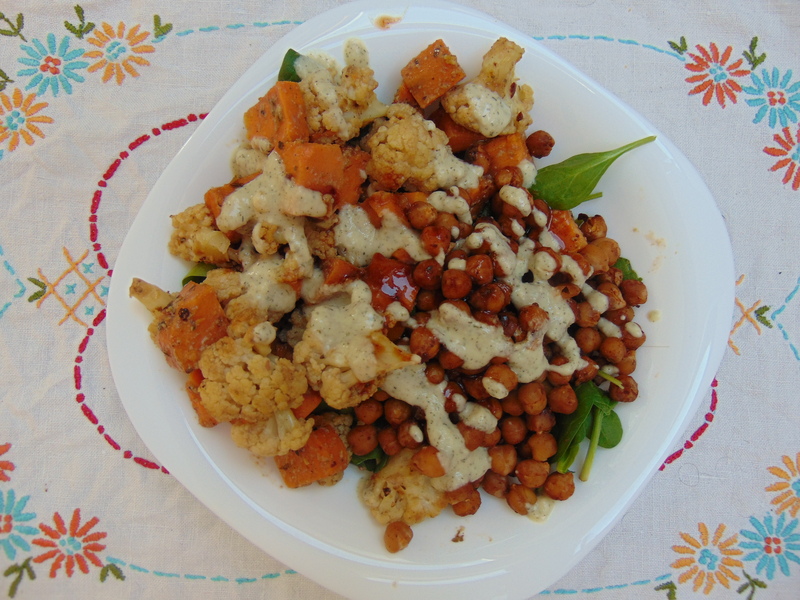 I added smoked tofu along with the fiery chickpeas so it would keep us going all day. With the firecracker sauce, ranch and peanut sauce it turned out to be quite a sloppy salad, but it was definitely a winner. 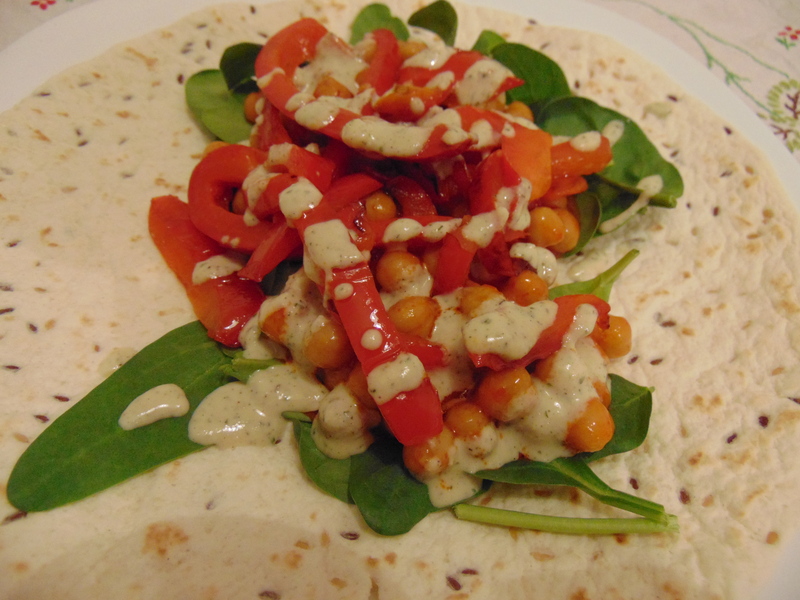 I couldn’t resist the cover photo of buffalo chickpea tacos, though we made ours as extremely messy wraps. Although it was really tasty, I felt that those chickpeas needed warming up. The sauce was delicious though, and it was another chance to use that ranch dressing. 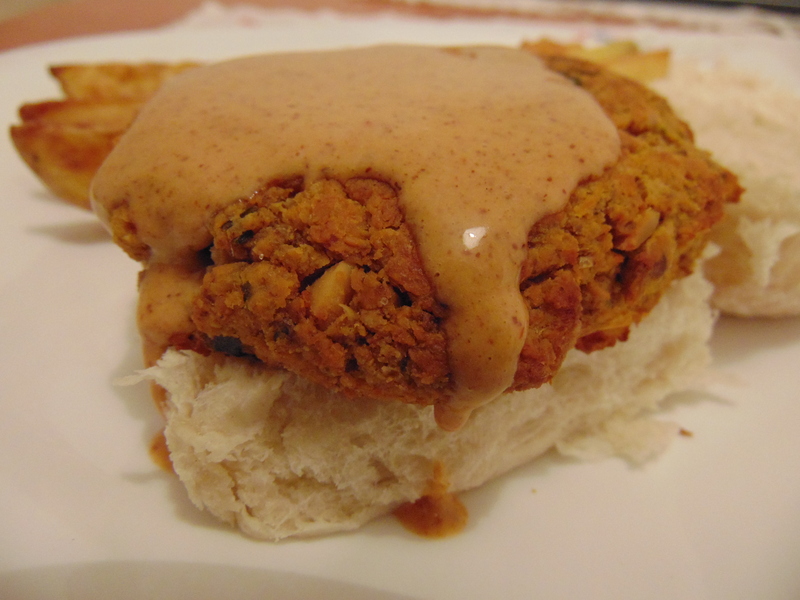 These sweet potato, peanut and chickpea burgers had been sitting in the freezer taunting me throughout our whole oven-less spell, but they were worth the wait. The patties held together really well, and they were really flavoursome. Initially I thought they were a little too sweet and nutty when paired with the almond-sriracha sauce – but then I got that fiery kick! I would have liked a few more recipes that used this sauce – I just used it as a sauce on some rice, smoked tofu and roasted peanuts, which I would definitely recommend. 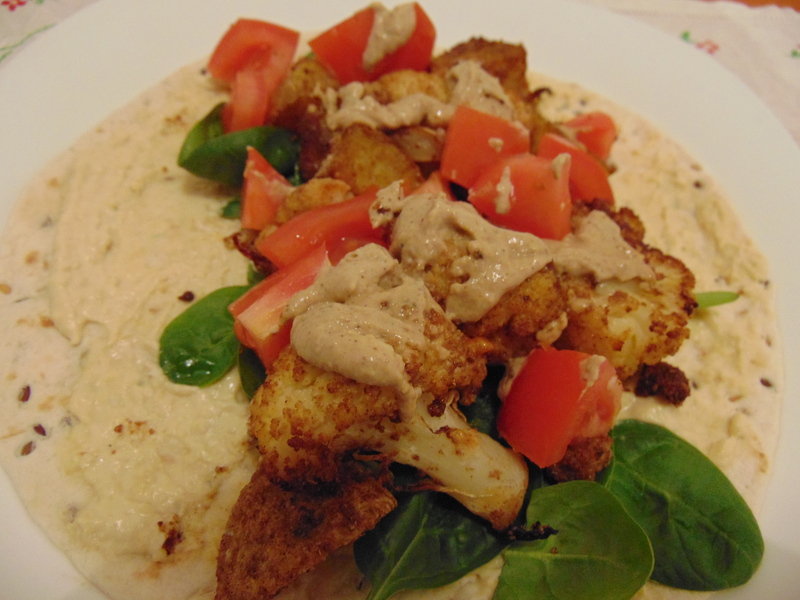 Also recommended: making these cauliflower shawarma wraps every day. They’re that good. Dr HH added some potato chunks to roast with the cauliflower, and he increased the oil as well, because you might as well do these things properly. 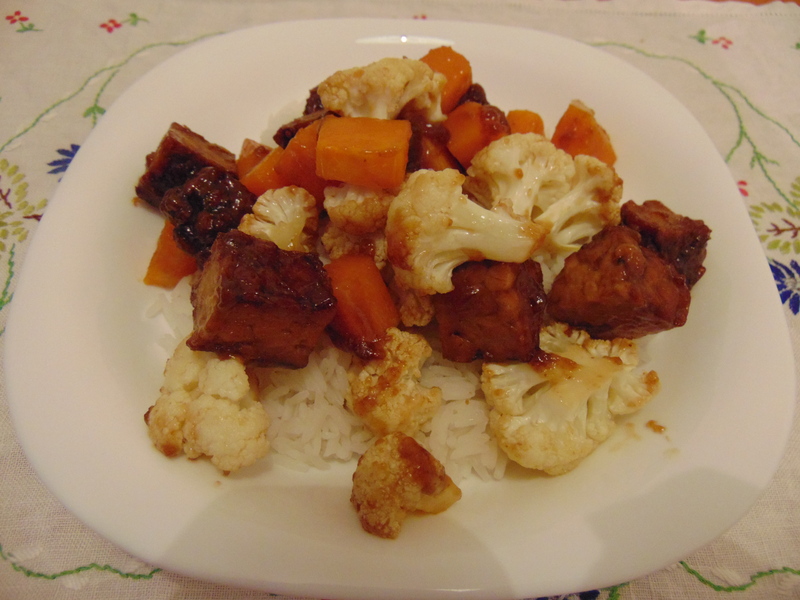 The spice blend was really good, and Dr HH has suggested using it on seitan as well…but that would mean missing out on this tender, tasty cauliflower! Everything came together beautifully as well, with hummus, salad and that incredible tahini garlic sauce that I talked about last time. Oh, so good. I have a bit of a love/hate relationship with bowls, in that I love eating them, but hate all the washing up they entail. I found this Buddha bowl with nacho-spiced sweet potatoes to be surprisingly light on labour and dishes, and very tasty to boot. I really enjoyed the nacho seasoning, and it was a chance to wheel out the ranch dressing again, along with a quick and easy barbecue sauce. I’d definitely make this one again. For our anniversary back in January, Dr HH and I had planned to have a pizza night. We don’t often collaborate in the kitchen, but pizza would be the perfect opportunity to do so, with Dr HH working his magic on the dough and mozzarella while I took care of the toppings. Alas, our oven was broken at the time, but in March we finally got to make the two pizzas we’d been thinking of. 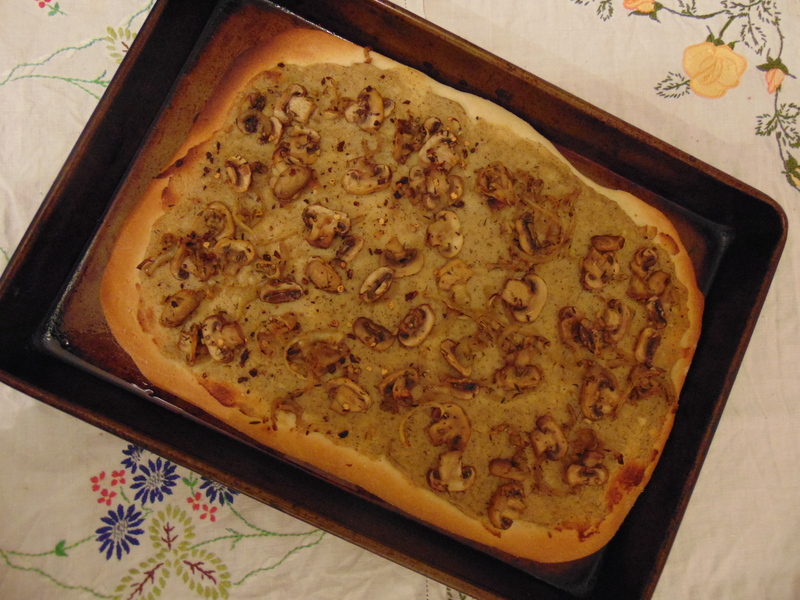 We made the mushroom-jalapeno white pizza with chilli flakes rather than jalapenos, but otherwise followed the recipe. The easy pizza dough was relatively easy, but needed a lot more flour than recommended to get it to come together. I’d already made the white garlic sauce for the lasagna in January, but it was nice to really get to enjoy the flavour in isolation this time -it was delicious. I must have thickened it up too much though, as there’s no way this would have been enough for a second pizza, as the recipe intended. It was a really garlicky, delicious pizza. 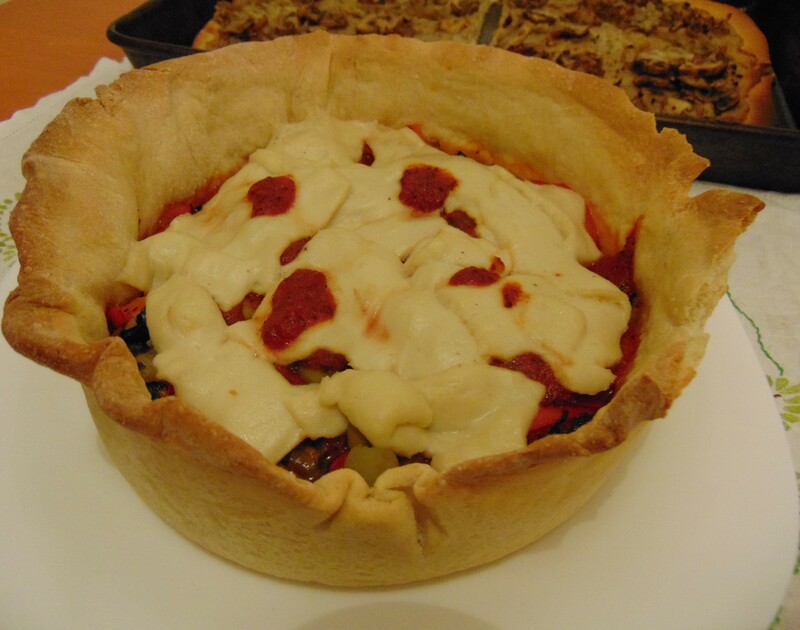 We used the same dough for the deep-dish pizza, along with the red pizza sauce and the vegan mozzarella. This was very exciting to make and had a fascinating texture. It didn’t melt as much as the pictures suggested, but it was lovely. The pizza was easy enough to assemble (though the dough started slipping down the dish when we put it in for a 5 minute bake while it was empty – we had to hook the dough over the top to save it), though a bit tricky and sloppy to serve up. 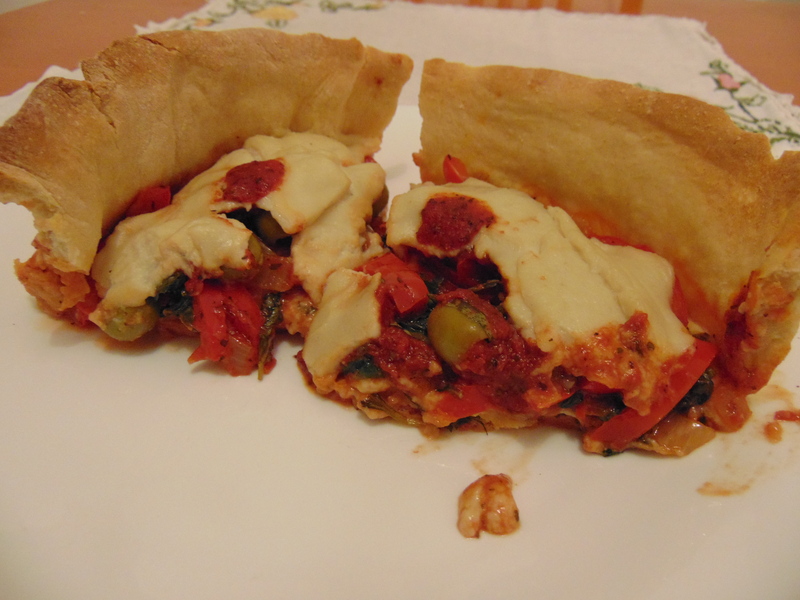 The crust was really soft where it was filled, with nice crispy bits higher up – perfect. We were worried it wouldn’t hold the filling, but there were no issues. I don’t really understand how Richa got such a nice picture for the book of an intact slice of pizza, while ours was oozing out everywhere. But it was delicious, and that’s more important than being photogenic. 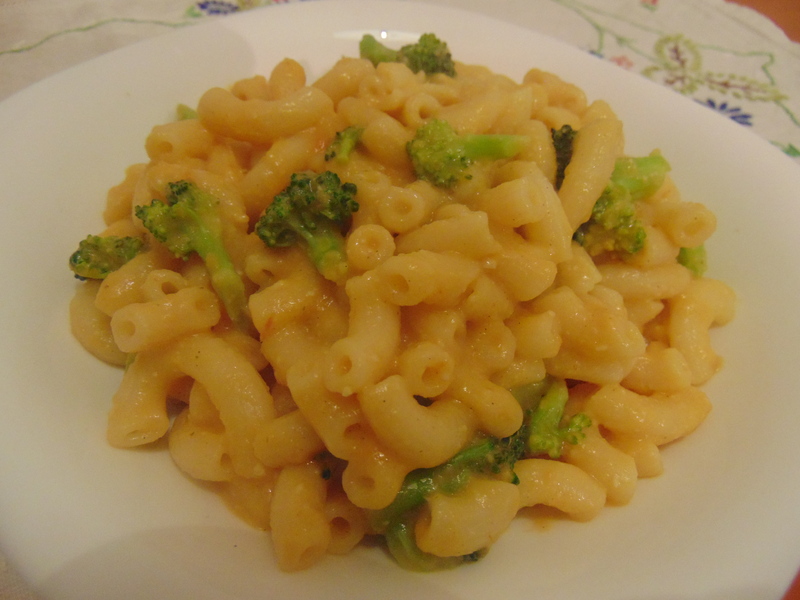 The black pepper cheesy mac and broccoli featured one of those cheesy sauces made from vegetables (in this case potato, carrot, tomato and onion). I’m not a huge fan of those sauces, as I don’t necessarily want my mac and cheese to taste of veg. It was fine, but was never going to bowl me over – I’ll stick to the smoky mac bake I made in January! Onto the sweet treats! I made the blender peanut butter cake as cupcakes, and in a mixing bowl as I don’t have a blender that’s up to the task. The recipe calls for a mix of dark and semi-sweet chocolate for the topping. I always assumed that semi-sweet was the American term for dark chocolate, so this left me a little baffled. I used milk chocolate alongside the dark, and I was happy with the result – the topping was smooth and glossy, and the sponge itself was delicious. I’ll certainly make these again. 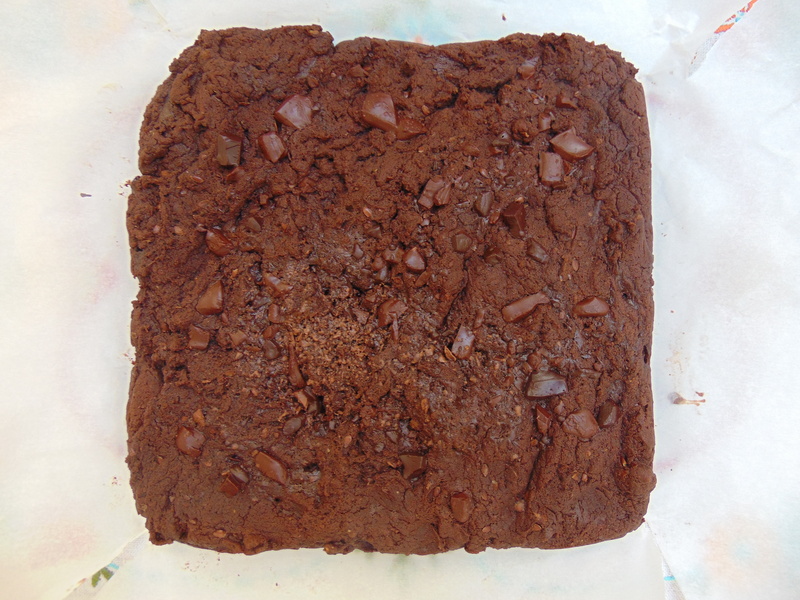 I had high hopes for Richa’s brownies, but they turned out quite dry. I’m not sure what I did wrong – I didn’t bake them a second longer than necessary, but they were well past the still-slightly-gooey-in-the-centre stage the recipe told me to aim for. Perhaps my new oven is just too powerful! They were still tasty (again, I used milk in place of semi sweet chocolate), but they weren’t at all brownie-like in texture. The brownie base for these almond butter cheesecake brownie bars was much more satisfactory – and these were all round delicious. The base stayed nice and sticky, and the cheesecake topping was really creamy, and much easier to make than expected. In fact, I’m going to keep this recipe earmarked for when I need something impressive but don’t have time to labour over it. 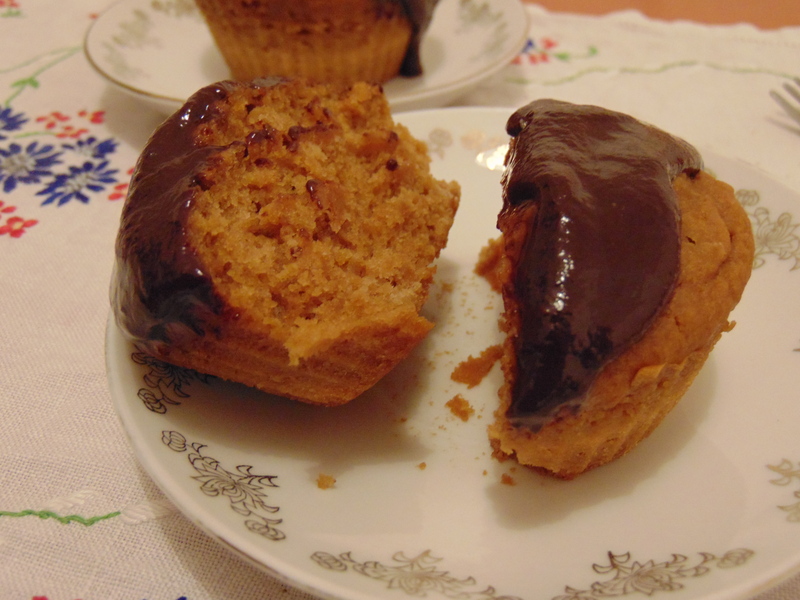 The lemon chia coconut muffins were not my favourite baked good from this book – they were solid, but not mind-blowing. Also,I forgot to sprinkle coconut and chia seeds on the top before baking. Doh! 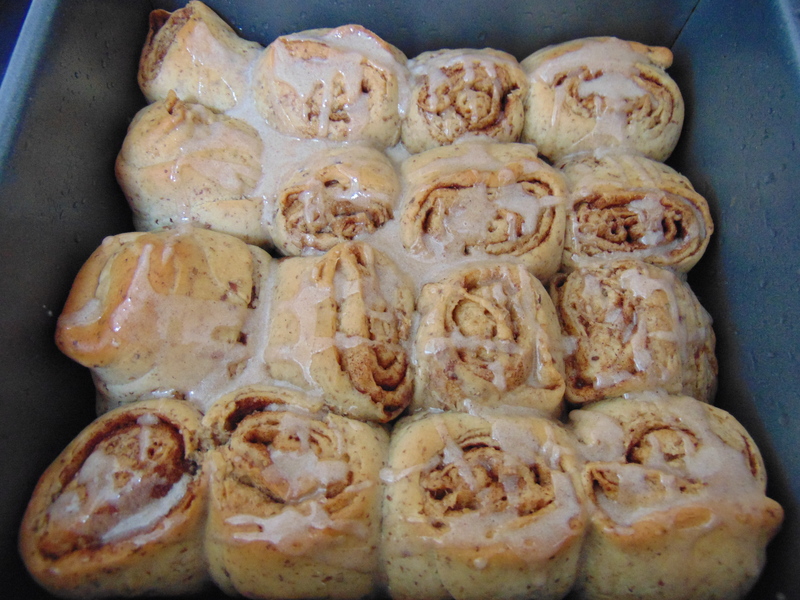 And finally, who could resist one hour cinnamon rolls? Dr HH was in charge of these, and he reported that the name was quite misleading – there was about 50 minutes needed for proving and baking, which leaves only ten for all the mixing and assembling, which is quite ambitious! Ninety minutes was more accurate. The rolls were nice and full of cinnamon, but he would prefer to let them prove properly and potentially see an improved rise and bake. Good for emergencies though, and a fine way to end this roundup. I would heartily recommend this book! There are some really simple dishes that you can throw together on a work night, along with more complex options for when you have time to put more effort in. I think it would also be appropriate for new vegans, as there aren’t too many expensive or unusual ingredients and it’s largely vegetable-based dishes. Also, it’s jam-packed with tempting recipes – there are still many more that I haven’t got round to trying yet. The only downside for me was that many dishes had several components (usually a sauce from a separate chapter or page), which required flicking between pages – I find that kind of thing a bit of a nuisance (and it does make a mess of the book, when you have messy fingers like I usually tend to), but the recipes were so good that it was definitely not a deal-breaker. If you haven’t already got a copy of this book, you should definitely add it to your list right now! 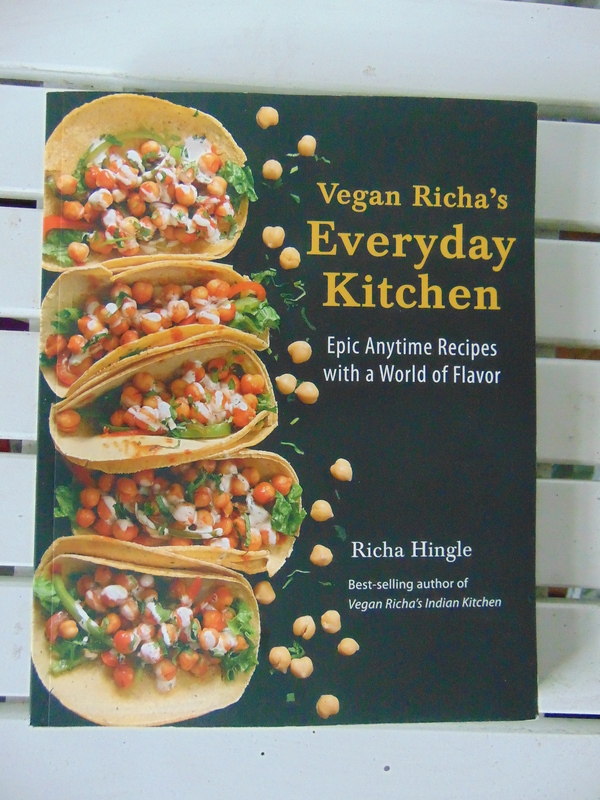 This entry was posted in Cookbooks and tagged vegan cookbook review, Vegan Richa's Everyday Kitchen review. Bookmark the permalink. we really liked the butternut teriyaki but definitely had the same feelings on the sauce – NEEDS MOAR SAUCE. I have to dive back in to this book soon! Ah, I’m glad it wasn’t just me! Awesome! You’ve made so many of the Recipes! Yep, if the brownies were dry/crisp, they got overbaked (oven, pan, something is definitely affecting it). I’ll send a note to the publisher for the next printing to double the teriyaki. 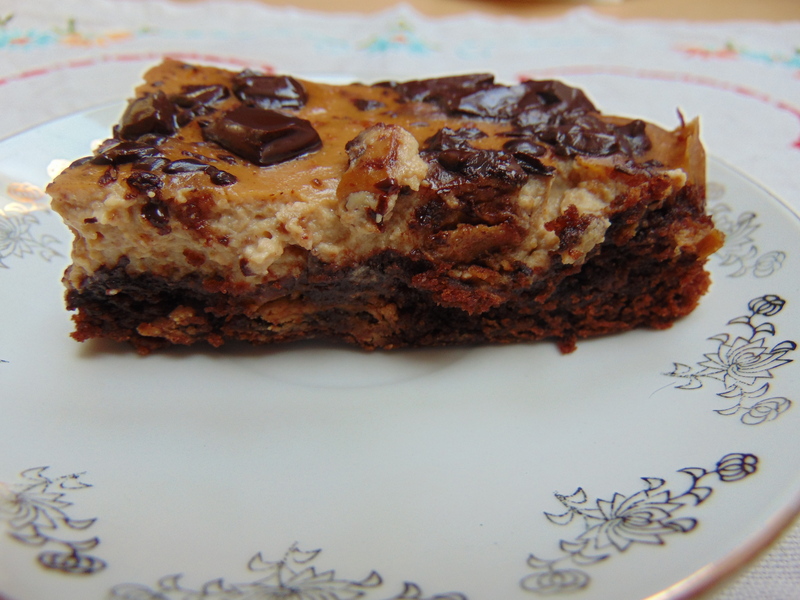 Those almond butter cheesecake brownies are so good!. The cheesecake holds the moisture even with baking time/oven differences. Thank you for the tips, and for bringing those cheesecake brownies and cauliflower shawarma into my life! Ha, yeah, ours didn’t last long enough to cool down! I went without an oven for 5 weeks not so long ago – I missed it a great deal! Either of those firecracker dishes would be right up my street, ditto the brownies and brownie bars. One followed by the other would be my idea of heaven. I love that Richa commented too! Excellent choices! I’m already looking forward to having the firecracker cauliflower again! 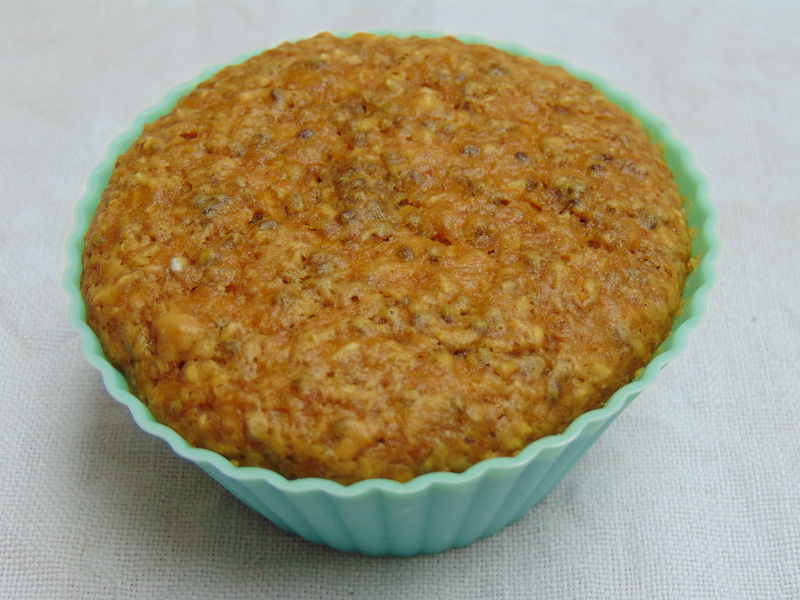 I think I reviewed this recipe for my chickpea or sweet potato recipe roundup. Those patties are like crack! I should make those soon. I think I have all the ingredients, so maybe a spur of the moment recipe for the week! I betcha Richa got that perfect deep dish pizza shot by cutting up cold pizza? I know that’s how I got a nice photo for my pot pie recipe. I am not sure what makes semi-sweet “semi-sweet” but i know I get semi-sweet chocolate chips and they are NOT dark. I am guessing maybe semi-sweet is for chocolate with sugar, but no milk? But not as high of a cacao ratio to make it dark? you are 100% right about the deep dish pizza. No way its going to look like that when hot! i mean it will hold its somewhat messy shape for the minutes till you are done eating, but not for photography. 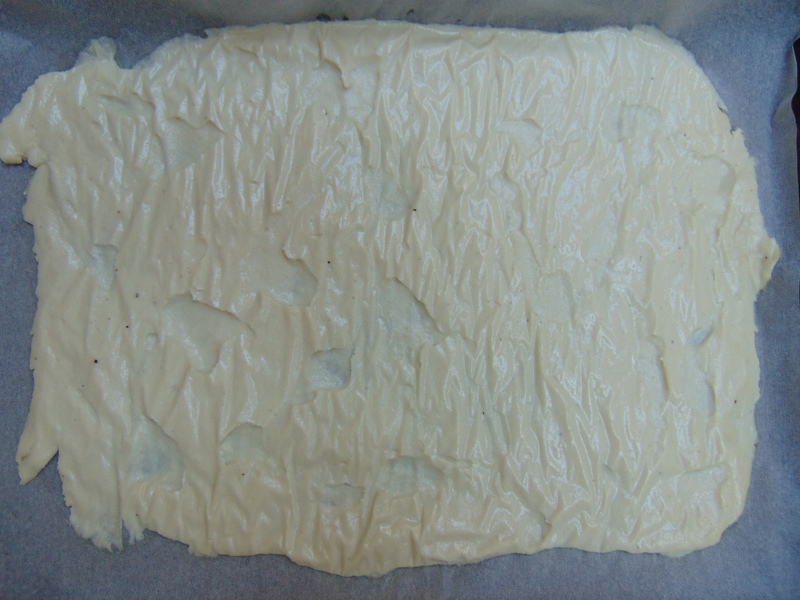 The holding depends on the moisture content in the filling.